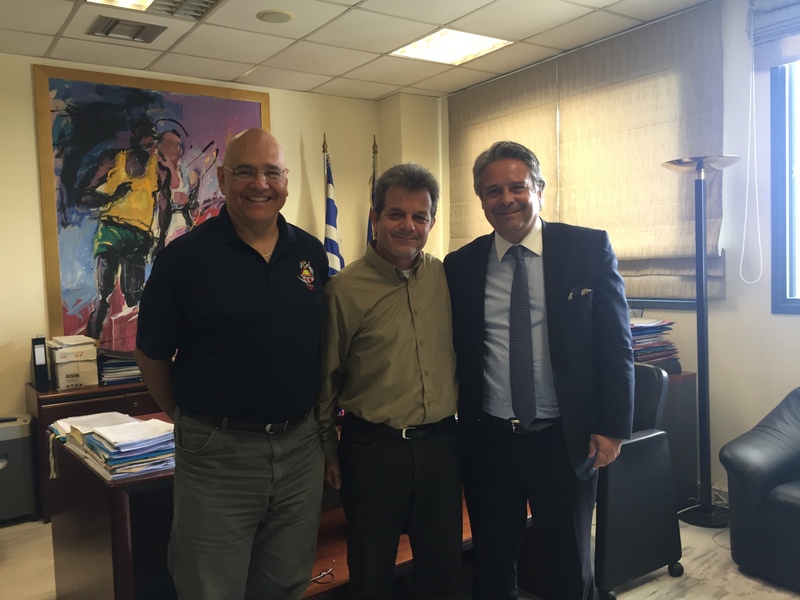 ESF Secretary General Ami Baran met with Kostis Liarommatis, President of the Hellenic Softball Federation [under the auspices of the Hellenic Gymnastic Federation] for meetings with the Hellenic Olympic Committee President and Secretary General as well as with the General Secretary of Sports Ministry in Greece. A few years back the Greek Sports Ministry decided to take away the independent status of the Hellenic Softball Federation and the Hellenic Baseball Federation and put them under the auspices of the Hellenic Gymnastic Federation, until that time they could stand on their own and in accordance with Greek Law. During this time Kostis has been working diligently in trying to revive the softball programs throughout Greece and try to regain the independence of the federation. The ESF Development Commission along with the WBSC Softball Division, have put a lot of efforts in trying to assist Kostis. Equipment is already on its way and growth of teams and coaching clinics will for sure bring the change. The fruit of the hard work came to fruition in a meeting that Ami Baran and Kostis had with the General Secretary Mr. Julious Synadinos, who immediately had his Legal team working on the preparation of the documents to allow the Softball to become independent. During the meeting the Baseball cause also came up and the proposal of combining the two sports into one Federation was discussed along with the possibilities of how it could be done so that both sports will be free legally to continue under their own federation. ESF Development has also approached equipment providers for baseball equipment as well. Time will tell and we hope that this process will not take so long.